This book by Khushwant Singh could also be titled as “My Musings”. More malicious Gossip is about the guru’s point of view about so many things in one place. The book has three trenchant parts each dealing with a separate subjects. The 280 pager is full of interesting stories, gossips, ideas and personalities. Part I, “With Mailce Unspared” is about the various personalities. Khushwant baba writes about George Fernandes, Phoolan Devi, Zail Singh, Mountbatten, Charles Sobhraj, Ingrid Bergman, Empror Aurangzeb, Faiz Ahmed Faiz, Abdul Sattar (Pakistan’s Former Ambassador to India) and even Zia ur Rehman (from Bangladesh). There are some personalities though which I know nothing about as they relate exclusively to India. Intrepid views about each makes this part unique. He rates Emperor Aurangzeb much higher than has been said about him by Hindu historians. He talks of Mountbatten’s wife cuckolding him and of Shabana Azmi. Khushwant Singh gives a good insight in to their characters in a very frank manner. Part II, “Going Places” is where he pens his travel experiences. From Syria, to Delhi, Amritsar, Goa, Bhopal, Lucknow, Hyderabad, Germany, Chattisgarh and more. He talks of issues, history and the people of these lands. The chapter, “Home to Hadali” is the same as that covered by him in his autobiography which itself is a masterpiece. He talks about the lasses of Syria, his meetings with the top bosses and Temples of the Sun in Konark. Again the chapter about Bhopal is as interesting as that of his autobiography where he wrote his first novel. He writes on distributing his time equally between writing, taking long walks and watching purdah ladies un-purdah themselves and bathe. It is undoubtedly the most interesting part of the book. Part III, “Musings” is where Khushwant Singh ponders overs issues as diverse as religion, God, racial hatred, marriage, death, family planning and even bride burning. He gives simple solutions to problems that have hounded India, of recently. I found the chapter quite logical and simple save for his views about God and religion. He quotes authors, philosophers and men of learning of the likes of Nabakov, Ghalib , Meer Taqi Meer, Shakespeare and even Iqbal to name a few. 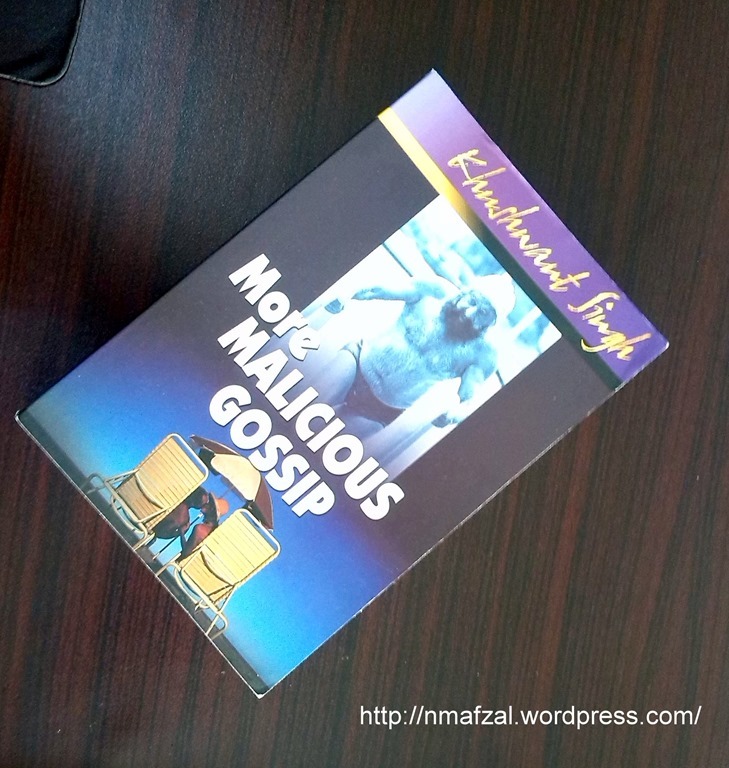 “More Malicious Gossip” is a book which one enjoys any day of the week. It is one of the best books I have ever read. Short, concise and to the point articles in different parts mean one can read them at one’s convenience and leisure. Highly recommended for anyone who like to read for the sake of reading.